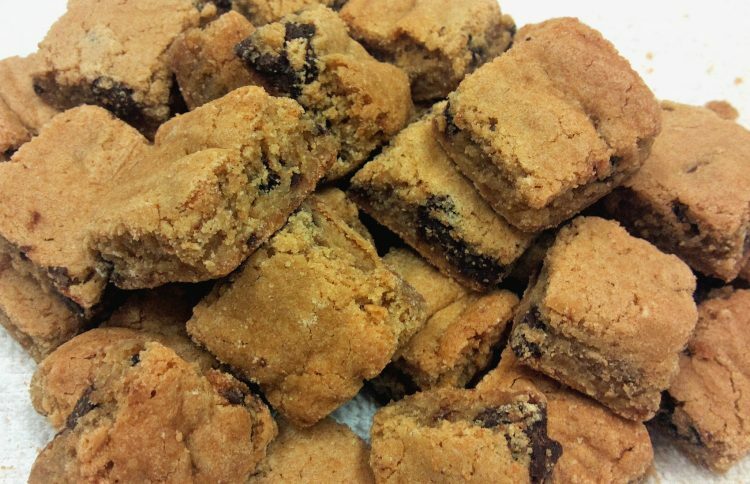 Gluten and grain free, these Chebe blondies are as quick to prepare as they are delicious to eat! And, with a couple of tweaks to the ingredients, they can be dairy free and/or egg free! Yes, scrumptious treats can be had for those who need or want to choose their ingredients carefully. Add brown sugar to softened butter and mix until combined. Mix in the eggs and vanilla extract until combined. Add 1 package of Chebe and mix on low until just incorporated. Fold in 1 1/4 cups chocolate chunks and transfer the mixture to a greased 9x13 pan. Sprinkle the remaining 3/4 cups of chocolate chunks evenly on top of the mixture and press lightly with wax paper to set into the dough. Bake for 25 minutes. Remove to a wire rack and let cool completely. Cut into 2-inch squares. Aquafaba (bean water) is the liquid from cooked legumes (pinto beans, chickpeas, lentils, etc. 3 Tbsp = 1 egg. We recommend liquid from the can of chickpeas. Ok these were great made these changes packed the brown sugar. 1/4 c tofu for eggs and reduced fat to 1/2 c butter flavored spectrum naturals organic shortning. Voila Vegan. Also it should be specified packed brown sugar or not. I have tried auqafaba in many recipes it does not turn out. Tofu is better. 1/4c silken tofu eqauls 2 eggs in most chebe based recipes. Gonna make these right now.. I would use white choc, since I dislike choc.